Rankin Wilbourne believes that “union with Christ may be the most important doctrine you’ve never heard of.” In fact, he says that “nothing is more basic or more central to the Christian life than union with Christ.” If the latter is true, then the former needs to be addressed. 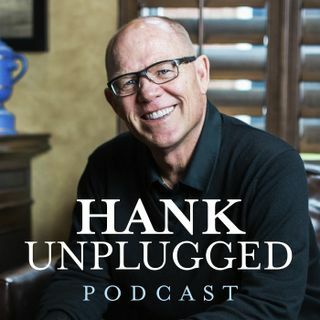 This edition of the Hank Unplugged podcast features a stimulating conversation between Hank and Rankin Wilbourne, author of the Gold Medallion–winning book Union with Christ. We truly believe that this conversation could ... See More change your life, and we pray that it leads you closer to union with Christ. Topics discussed include: Wilbourne’s transition from banking to ministry (2:30); Christians uniting around the essentials with the ecumenical spirit called for in John 17 (6:30); the Early Church Fathers and union with Christ (10:15); why isn’t union with Christ a more central part of our lives? (13:30); importance of biblical metaphors (16:00); the fully human life found through life in union with Christ (18:55); reducing the gospel to the mechanics of salvation (23:45); what is the message our culture needs to hear? Both the songs of Extravagant Grace and Radical Discipleship (28:00); the gospel is union with Christ, a double Grace of Justification and Sanctification (32:30); why have so many in the West lost the ability to delight in divine mystery? (36:15); how is union with Christ the doorway to communion with God? (39:25); is communion with God your highest ambition? (44:30); how suffering is integral to knowing Christ (51:20); reclaiming words from our biblical tradition such as deification or theosis and even the word tradition itself (53:50); why do so many Protestants have a view of church ecclesiology and the sacraments so at odds with our Christian tradition? (58:25); sailing as a metaphor for our life with God (1:01:00); the importance of developing spiritual disciplines to truly experience full union with Christ (1:03:25); reading the New Testament with integrity and the “gap” addressed in Union with Christ (1:07:00); false choices we are faced with and the clarity that union with Christ brings (1:10:00); embracing the Lord’s high priestly prayer (1:12:35); 1 Corinthians 3 and the importance of setting the alignment of our ambitions in accordance with Christ (1:15:45); the critical need to know the biblical truth of union with Christ (1:22:30).